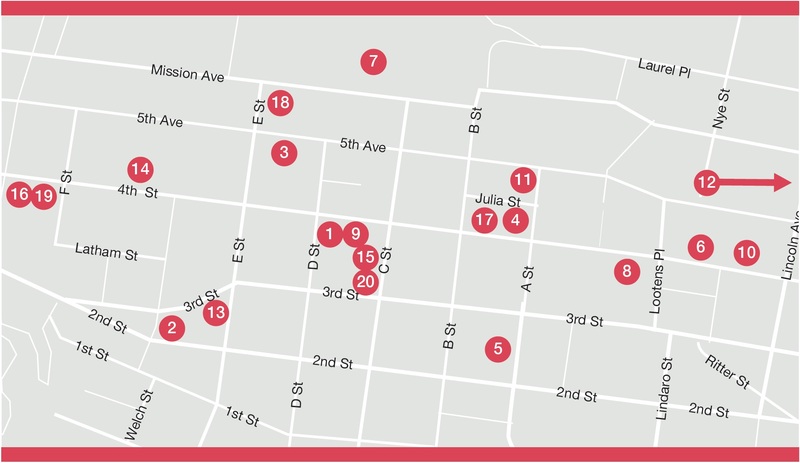 The Downtown San Rafael Arts District partners with local arts leaders, businesses, city officials, and community members to create a vibrant and engaging environment that promotes well-being, equity, and inclusivity through the arts. Provide access to world-class arts and culture education and experiences for everyone in San Rafael. Embracing the arts to build inclusive community relationships and dialogue to confront and address pressing social and economic issues. Engaging the under-served and disadvantaged populations in our community to promote greater equity and diversity. Creating a welcoming and innovative downtown community anchored and unified by a thriving arts and culture scene. Create opportunities for San Rafael youth. Promote a safer, cleaner, more aesthetically pleasing environment. Generate more business traffic through increased tourism. Originating with the adoption of Assembly Bill 189 in 2015, the California Cultural Districts program aims to leverage the state’s artistic and cultural assets. Aligning with the mission and values of the California Arts Council, the districts will celebrate the diversity of California while unifying under an umbrella of shared values—helping to grow and sustain authentic grassroots arts and cultural opportunities, increasing the visibility of local artists and community participation in local arts and culture, and promoting socioeconomic and ethnic diversity. Art Works Downtown 1337 4th St.
Bananas at Large 1654 2nd St. The Belrose 1415 5th Ave.
Christopher B. Smith Rafael Film Center 1118 4th St.
Community Media Center of Marin 819 A St.
Copperfield’s Books 850 4th St.
Falkirk Cultural Center 1408 Mission Ave. The FolkArt Gallery 1321 4th St.
George’s Nightclub 842 4th St.
Italian Street Painting Marin 5th St. and A St.
Marin Shakespeare Company 514 4th St.
Marin Society of Artists 1515 3rd St.
Open Secret Bookstore 923 C St. Rebound Bookstore 1611 4th St.
RileyStreet Art Supply 1138 4th St.
San Rafael Public Library 1100 E St.
Seawood Photos 1601 4th St. Youth in Arts 917 C St.
Hands-on activities with our INSPIRE exhibition at Youth in Arts, 917 C Street, San Rafael, CA 94901. We are working with the city to get community (specifically youth) feedback for San Rafael’s 2040 Plan. Participants will consider their dreams for San Rafael in 2040. 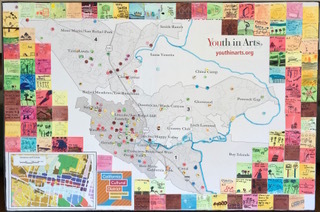 Using tags featuring categories such as “arts and culture,” "open spaces,” “transportation,” and “community gathering spaces.” Participants will be encouraged to choose the ones that best represent their wants and needs and mark an enlarged map of San Rafael with their tags. In this way, gallery visitors will be polled in an interactive way to gain better insight into their expectations for the future of San Rafael. Participants will be provided with small paper squares and drawing utensils. 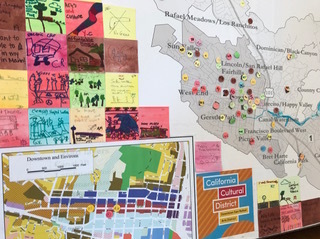 They will be prompted to draw how their choices in the Interactive Response Map might be realized in the actual landscape of San Rafael. Participants will be able to take their mini-artwork home with them or add it to a larger collaborative art piece which will be featured in the Youth in Arts downtown gallery. The newly designated Downtown San Rafael Arts District, located along Fourth Street in San Rafael, officially launches this Fall with an exciting array of arts programming centered around the shared theme of Latinx. Latinx is inspired by national movements such as Spanish Heritage month and National Arts Education Week, as well as the City’s 30th Anniversary of the Día de Los Muertos celebration in November. Audiences of all ages can enjoy and experience a range of arts perspectives and voices from Latin America ranging from exhibits, film screenings, family programs, and more. Please check back periodically. This website will develop as the Downtown San Rafael Arts District develops. Inform others about Downtown San Rafael Arts District! *We will do our best to return your email in a timely manner.